If you're an avid shell collector, you probably have bowls full of shells all over the house. A custom-made shell lamp is a great way to display your impressive collection. No, we're not suggesting you make a tacky shell lamp like the one in the movie "My Big Fat Greek Wedding." By filling a decorative lamp with shells, you give your collection a purpose and beauty it may be lacking. Go to a local crafts store and look for a glass table lamp. You want one that has a round or oval-shaped globe that can be filled with shells. The lamp should come with all the necessary lighting components. Buy a lampshade to fit the lamp. Choose between round or square shades. Pick up the appropriate wattage light bulb if you don't have one at home. Turn the lamp upside down. Unscrew the base from the lamp. Keep the metal rod in place, which runs from the top to bottom of the lamp. Begin to fill the glass globe with shells. Carefully put each one in place by inserting your hand inside the globe. Take care to place the best looking shells along the outside of the glass. Any shells that are broken or discolored can be used in the center for filler. Continue to fill the globe with shells until it's full. The shells will shift slightly when you turn the lamp upright so fill it as much as possible. Screw the base back into the lamp. Turn it upright and look at your creation. Add the light bulb and lampshade and plug it in. If you have some truly unique shells, like starfish or conch shells, separate them so one is showing on each side of the lamp. Take into account the shell colors when arranging them. This will prevent you from having too many dark shells in one area. Decorate the lamp shade by hot gluing some shells along the base. 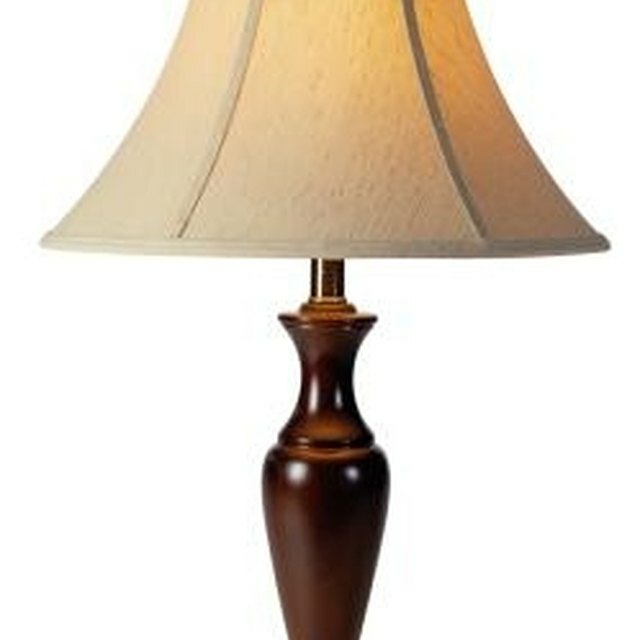 This will make the lamp look even more custom-made. How Do I Know If I Need T8 or T12?